Something Old and New, Borrowed and... GREEN! : Lawn Games! 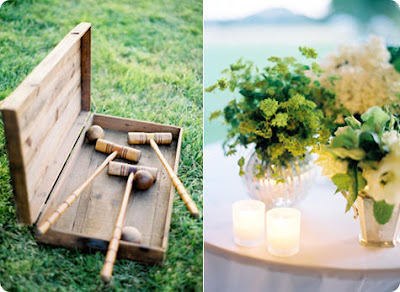 Since the bridal party is busy taking pictures and such before the reception begins, I plan to have some fun things planned for the guests while they wait for the party to start. 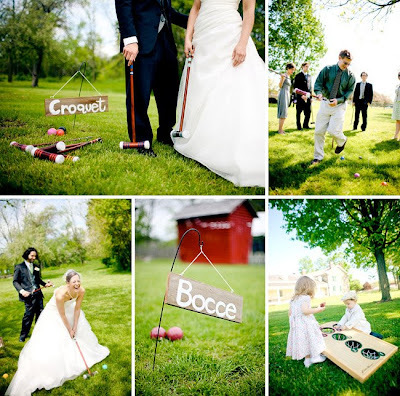 Our friends and family all love lawn games (we always manage to play some corn-hole or ladder ball when we all get together) so I figure why not have some available to them when they arrive on the reception site? I figure this will be a perfect way for people to mingle while beginning the cocktail hour and it is also a fun way for people to enjoy themselves even during the reception (for the non-dancers). I think it would be awesome to start browsing around for some vintage lawn games (thrift stores? ebay?) 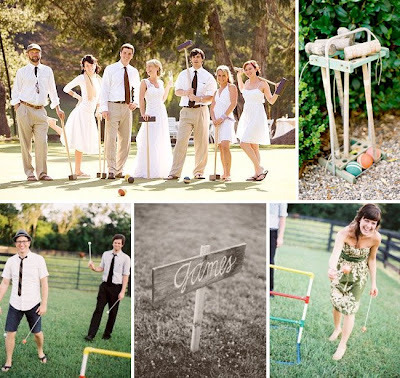 or have all the lawn games painted in our wedding colors (green!). I got over my lazyness. That was on the One Love photo blog you posted a picture from with a wonderful picture of a bride playing badmitton.